April 22, 2018 is Earth Day. Back in December 2017, L'OCCITANE Canadian flagship boutique at the Yorkdale Shopping Centre was fully redesigned with a strong sustainability focus at its core. For the first time in North America, L’OCCITANE Yorkdale offers an in-store bottling recycling program in partnership with Terracycle. Customers can bring in any full size product of any brand to recycle, and will receive a 10% discount on any purchase. 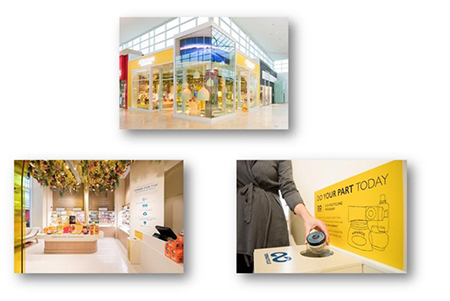 L’OCCITANE strives to positively contribute to the environment in other ways as well. Our packaging uses already-recycled materials, most notably our Eco-Refills offer bestselling formulas with 80% less plastic than a bottle. Some examples of our bestselling Eco-Refill options, including our Almond Shower Oil, Immortelle Precious Foaming Cleanser, and Aromachologie Repairing Shampoo. It's good to hear that L’OCCITANE is helping to reduce the use of plastics by recycling, and by using recycled plastic and less plastic in their containers. Almond Shower Oil is great eco-friendly option! I really like the fact that quite a few firms are celebrating Earth Day, I don't remember as many doing so last year. It's great to see Companies getting involved!